The delegation of Serbia was led by Prime Minister Mr. I. Dacic, and also included First Deputy Prime Minister Mr. A. Vucic, Foreign Minister Mr. I. Mrkic, Minister without Portfolio in charge of EU integration Mr. B. Ruzic, head of the negotiating team Ms. T. Miscevic and Serbian president's foreign policy advisor Mr. M. Djuric. The European Union was represented by Greek Deputy Prime Minister and Foreign Minister Mr. Evangelos Venizelos and the EU enlargement commissioner Mr. Stefan Fuele. 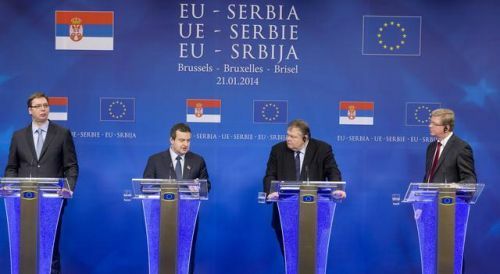 Prime Minister Dacic delivered the introductory statement of the Serbian government. The conference was also attended by Austrian Foreign Minister Mr. Sebastian Kurz, his Croatian and Romanian counterparts Ms. Vesna Pusic and Mr. Titus Korlataen, as well as other officials. Upon the conclusion of the first intergovernmental conference between Serbia and the EU, Mr. Fuele said that the beginning of EU accession talks comes as a well-deserved recognition for the efforts and brave moves of the country's leaders. The key factor in this was the determination of the Serbian government to accept reforms over the years and the brave efforts made over the past few months to normalise relations with Pristina, Mr. Fuele said at a news conference with Serbian Prime Minister Ivica Dacic, First Deputy Prime Minister Aleksandar Vucic and Greek Foreign Minister Evangelos Venizelos, as the President of the Council ot the EU.